Why use a thermal fluid in a food and beverage processing facility? Heating and cooling products in a food and beverage processing plant often requires the use of a heat exchanger. Heat exchangers may contain heat transfer fluids that absorb excess heat energy and take it away from the product, or transfer heat energy to the product. Applications of heat exchangers in food and beverage processing include brewing of beer, vegetable oil deodorising, food additive manufacturing, food packaging production and food preparation including baking, frying and cooking. Do I need a food grade heat transfer oil? Heat transfer oils for food processing must be fully H1 or HT1 certified as food grade heat transfer fluids by the US Food and Drug Administration (FDA) and the NSF International. While this is not a legal requirement, auditors such as the BRC often require heat transfer fluids in food processing plants to be H1 or HT1 certified. The regulation applies to any product manufactured for human consumption, including pharmaceutical products, and is in place to ensure consumer safety in case of incidental contact with products. If food and beverage manufacturers use a standard heat transfer fluid and there is incidental contact with a food product, the whole batch will have to be scrapped. It can be costly to dispose of products and can damage a company’s reputation if the product has to be recalled. Are there other fluid regulations for food? The distribution of food grade thermal oils is highly regulated in Europe and companies must comply with Registration, Evaluation, Authorisation and Restriction of Chemicals (REACH) and CLP regulations. These regulations refer to the classification labelling and packaging of substances. All heat transfer oils degrade over time and the rate of degradation increases as the operational temperature increases above that of the oil’s recommended use. At high temperatures, the bonds that exist between hydrocarbon chains start to break, resulting in the production of carbon in a process known as fouling. As the carbon concentration in the fluid increases, it starts to deposit as a sludge on the insides of pipework in heat transfer systems. Carbon is an insulator, so the build-up reduces the efficiency of heat exchange, which can be costly for business. Food and beverage processing often involve high temperatures, so it’s important to choose a thermal fluid with high thermal stability. Food manufacturers should invest in food grade heat transfer fluids because they are hydro cracked, short chain molecules, which gives them a strong resistance to fouling, slowing their degradation. What else should I look for in a thermal fluid? Food and beverage processing reactions must take place at very specific operational temperatures. 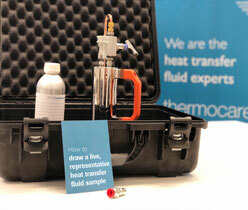 Therefore, a heat transfer fluid with precise temperature control is needed. It is also important to select a heat transfer fluid with a high flash point. The flash point is the temperature at which a fluid produces enough vapour to be ignited. Therefore, the higher the flash point, the lower the risk of fire. Global Heat Transfer has worked with food manufacturers for over 30 years to develop a thermal fluid that best suits food processing applications. Compared to other mineral oils, Globaltherm™ FG has superior oxidation properties because it produces smaller carbon particles when it degrades. This means it can operate at the high temperatures required in a food and beverage processing plant for extended periods. Globaltherm™ FG also has a lower viscosity than standard mineral oils, so is easier to pump around the system. It is colourless, odourless, non-toxic and non-hazardous, which means it does not require any special handling and is not considered a controlled substance under the United States Occupational Safety and Health Act (OSHA), the Canadian Workplace Hazardous Materials Information System (WHMIS) or other work place regulations. How do I maintain my food grade heat transfer fluid? If your system and fluid are not properly maintained or checked regularly, the product can be affected. For example, a food product may be cooked inconsistently, or a pharmaceutical product may not blend properly. At this stage, the fluid has degraded. It must be diluted or completely flushed from the system and replaced, which causes expensive downtime and additional capital expenditure, both of which could be avoided with a proactive and preventative maintenance programme. You can extend the life of your food grade fluid with help from Global Heat Transfer’s preventative maintenance programme, Thermocare. Taking samples every quarter allows you to spot any changes in the fluid and react, before it impacts the product. We provide advice on how to choose the most appropriate oil for your heat transfer applications and provide our customers with continued technical support. Call us on +44 (0)1785 760555 for more information. Globaltherm™ FG is suitable for applications where vegetables, fruit, meat, poultry, fish or seafood is processed and production facilities such as a brewery, bakery, winery or dairy. Globaltherm™ FG has superior oxidation properties, as it produces smaller carbon particles when broken down. It also has a lower viscosity than a standard mineral oil, making it much easier to pump. Globaltherm™ FG thermal fluid is colourless and odourless, non-hazardous and non-toxic which means it requires no special handling and is not considered a “controlled substance” under United States OSHA, Canadian WHMIS or other work place regulations. Globaltherm™ FG thermal fluid is also used in pharmaceutical, animal feed production, laundries, industrial heating and cooling processes. Food grade cleaning and flushing product is also available.